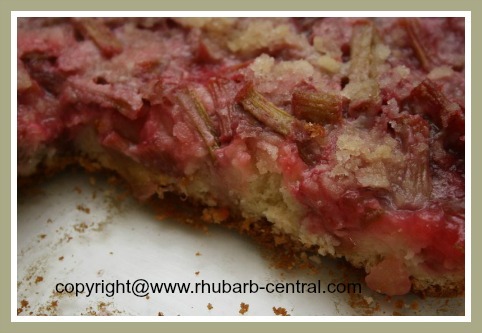 This Easy Fresh Rhubarb Cake Recipe, called "Rosy Rhubarb Cake", was submitted by Cindy who wrote, "... this recipe was given to me by an older lady at Church and has become a family favourite that disappears quickly!" Make this amazing rhubarb cake using 6 cups of fresh rhubarb and strawberry Jello or Gelatin Crystals. I made this recipe myself this past week, and I found the recipe easy, and the taste scrumptious! 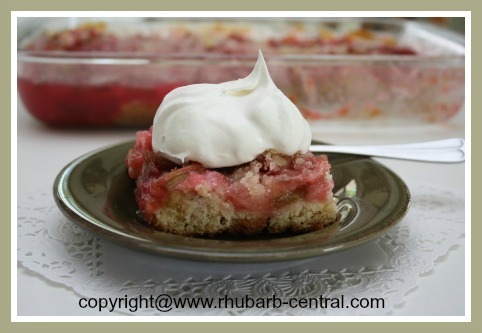 Thanks Cindy for sharing this rhubarb recipe with other visitors to Rhubarb Central! In a small bowl, whisk together the 2 cups flour and the baking powder. In another, larger bowl, beat with an electric hand-mixer the shortening with the brown sugar until well combined. Add the egg, and continue to beat. Add the milk alternately with the flour and baking powder mixture, and mix until combined, do not over-mix. Spread into the bottom of a lightly greased (I used non-stick cooking spray), 9" x 13" baking dish. Mixture will be "sticky" ... I used the flat side of a spoon to smoothen the batter (see photos). 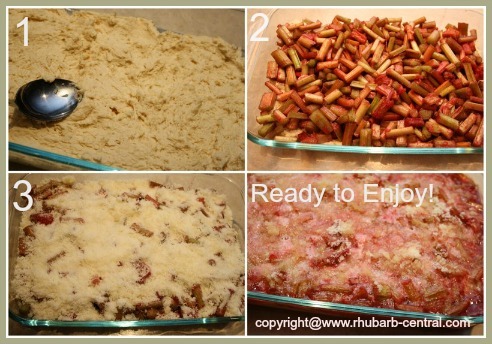 Combine the Jello crystals and the chopped rhubarb in a bowl and toss to coat, and spread over the first layer in the baking dish (see image below). 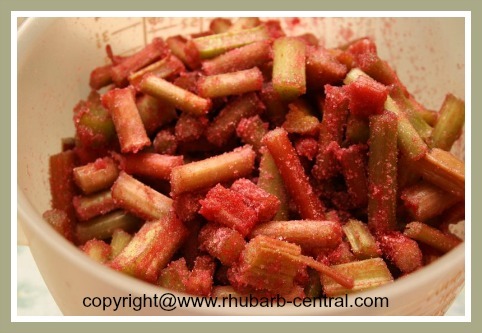 Making a Yummy Rhubarb Cake Using Fresh Rhubarb! In a bowl, stir together the granulated sugar and the melted margarine. Stir in the 1/3 cup flour and sprinkle over the rhubarb layer in the baking dish. Bake at 350 ° F for about 50 minutes. 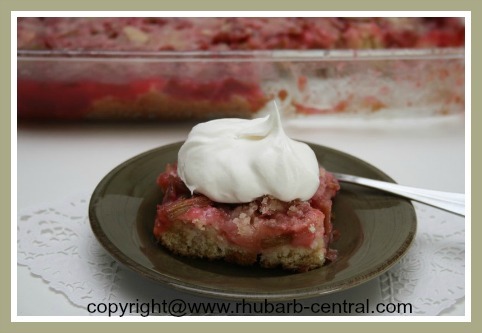 Enjoy this fresh rhubarb cake recipe plain, or with a dollop of ice cream or whipped cream! Yummy! TIP - if you have fresh strawberries on hand, slice a few over-top to make this treat berry special!